Our clients have been in their home for almost three decades and felt it was time for an update. When they burned their laminate countertop, that was the impetus they needed. They scheduled an appointment with Harvey Remodeling to discuss their project. Our talented designer, Julie White, met with them and listened to their ideas for their home and their frustrations with the current space. The clients cook every day and storage and counter space were an issue. They needed better places for pots, pans, baking sheets, cutting boards etc. and wanted updated, quality cabinetry with slides, roll trays and full extension drawers. Additionally, they entertain, a lot. At times they have upwards of 45 people over for brunch and the space was tight and difficult to work in. Much of the space between the kitchen and family room was not being used efficiently and effectively. 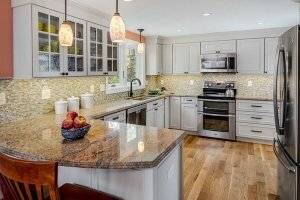 After reconfiguring the layout of the kitchen, we lightened and brightened it with beautiful cabinetry in Light Mocha, and installed a stunning glass backsplash and warm granite countertops. The cold tile floor was replaced with cozy, wood floors. Dramatic lighting added the finishing touch. 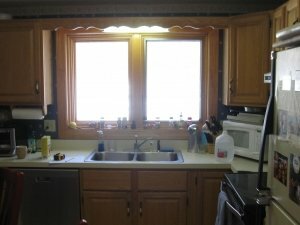 The end result is a beautiful, bright kitchen they can enjoy for a long time to come! 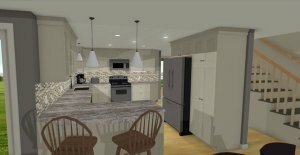 Stay tuned for next post where we will show you the family room makeover our wonderful clients completed along with their kitchen remodel. It is a stunner!